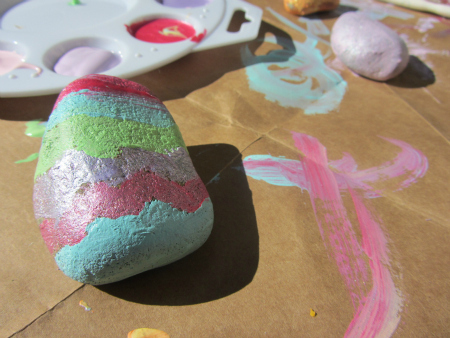 Painting rocks is a classic craft and a family favorite around here. 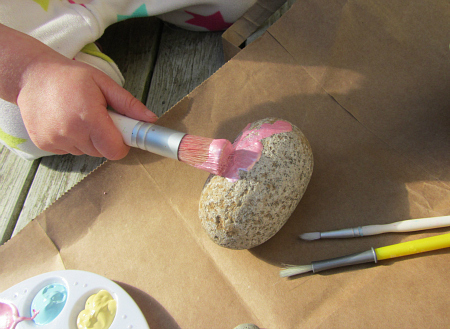 When my daughter and I gathered rocks outside, I didn’t tell her what they were for. Knowing if I asked her what she wanted to do with them she’d say “Let’s paint!” and she did. 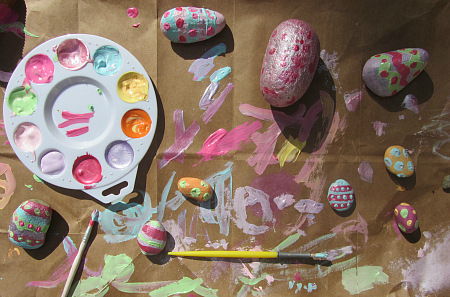 To make the painted rock Easter Eggs, we used the Martha Stewart paints that I got for Grandma’s Brag Bag we made last spring. I love these paints for adult crafts, but they are not at all washable. Have wet sponges on hand for anything that might get paint on it like little boots that trail across your deck… for example. You could do this with more kid friendly paint, but I just love the colors that this paint comes in. And frankly, it’s what I had on hand. Gather your materials. 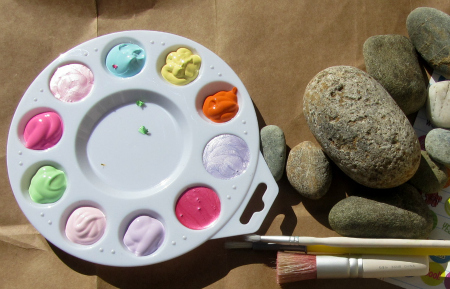 Collect rocks, paint (all weather so the eggs last outside), brushes, a drop cloth like a paper grocery bag, and sponges or a wet rag for cleaning up spills. After some pink, she decided, like many of her favorite clothes, this egg needed to have polka dots. While she made the dots, I made a striped egg. 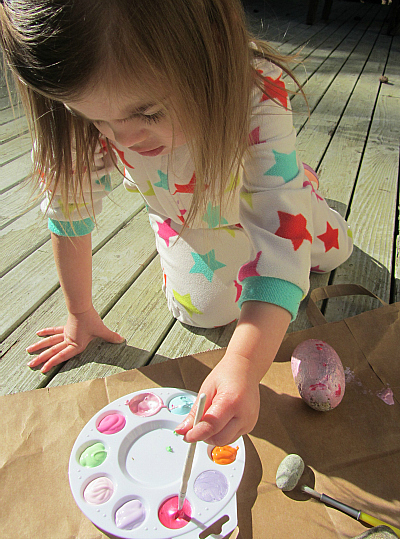 She helped me choose a few of the colors for the other eggs, but after she finished her big polka dot one she was ready to move on to playing in our garden while I had a blast painting in the sun. 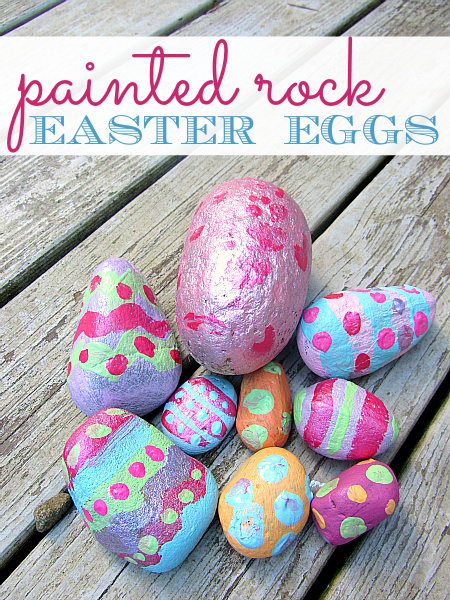 She came back a few times to observe and give me tips like “Make it polka dots!” for my painted rock Easter Eggs. As we know, toddlers aren’t made to sit for long periods of time carefully working on projects. So don’t take it personally if they have enough way before you thought they would. 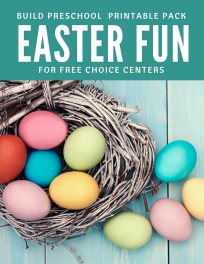 For more great Easter craft ideas follow me on Facebook! I wish here in scotland we Could do that outside in our PJs 🙂 We Will try with our coats on on the Beach 😉 not too bad i guess. Love your creativity! Thanks for sharing with us! What a super inexpensive idea. 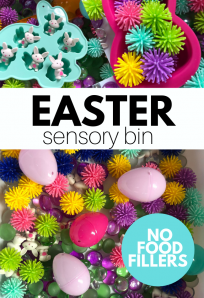 These will brighten up any playroom. Is this acrylic paint?? Love the shiny colors!! Yes. It’s Martha Stewart Multi Surface paints. 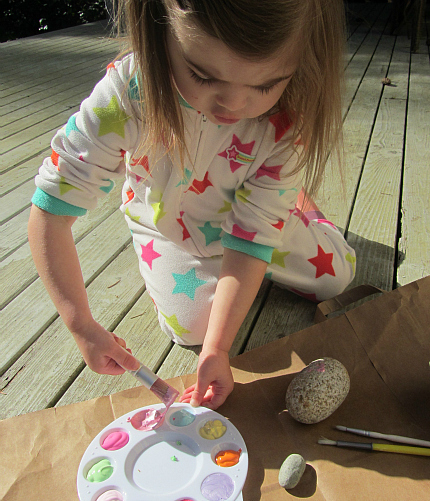 I love this idea…beautiful colours and always fun to incorporate nature into activities. 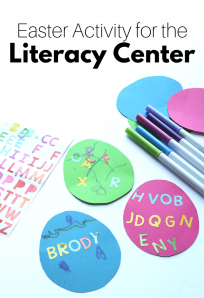 Pinning now…thanks for the inspiration! What a great idea and they look great. Rocks easy for kids to find themselves and handle, unlike some objects, they won’t get away on little hands. As an artist I sometimes use the sample size paint in Home Depot or other stores that they will gladly mix to any color, and they come in jars with lids! Thanks for the ides!